Pneumatic system uses compressible fluid as working medium usually air. In pneumatic systems, compressibility effects of gas cannot he neglected and hence dynamic equations are obtained using conservation of mass.In this we will derive the transfer function of pneumatic system. In pneumatic systems, change in fluid inertia energy and the fluid's internal thermal energy are assumed negligible.In pneumatic system which employs compressible fluid as working fluid, the mass and volume flow rates are not readily interchangeable and the analysis of gas flow is more complicated. The pneumatic devices involve the flow of gas or air, through connected pipe tines and pressure vessels.Hence the variables of pneumatic system are mass flow rate, qm and pressure, P. The mass now rate is through variable and it is analogous to current.The pressure is across variable and it is analogous to voltage. The two basic elements of pneumatic system are the resistance and capacitance.The restrictions in the pipes and valves offers resistance to gas flow. The gas flow resistance, R is defined as the rate of change in gas pressure difference for a change in gas flow rate.We will learn about the derivation of transfer function of Pneumatic system. The pneumatic capacitance is defined for a pressure vessel and depends on the type of expansion process involved. The capacitance of a pressure vessel may be defined as the ratio of change in gas stored for a change in gas pressure. Pneumatic devices are employed in guided missiles,air craft systems, automation of production machinery and in many other fields as automatic controllers. 1)The air or gas used is non-inflammable and so it offers safety from fire hazards. 2)The air or gas has negligible viscosity, compared to the high viscosity of hydraulic fluids. 3)No return pipelines are required since air can be let out, at the end of device work cycle. The disadvantage in pneumatic system is that the response is slower than that of hydraulic systems, because of the compressibility of the working fluid. A simple pneumatic system is shown in the below figure and it consists of a pneumatic bellows in line with the restriction.The pneumatic bellows consists of a hollow chamber with thin pneumatic walls.The side walls of bellows are corrugated and the input and output surface are flat.An increase in pressure within the bellows results in an increase in separation between the input and output surfaces. Let the pressure of air source be increased from its steady state value by an amount pi.This results in an increase in air flow by qm and increase in the pressure inside the bellows by p.Due to increase in pressure, there will be a displacement of the movable surface of the bellows, by an amount x.Here, the terms pi, qm, p and x are all functions of time, t and so can be expressed as pi(t), qm(t), p(t) and x(t).Let us get into transfer function of pneumatic system derivation. The force exerted on the movable surface of the bellows is proportional to increase in pressure inside the bellows, i.e, fb ∝ p(t). 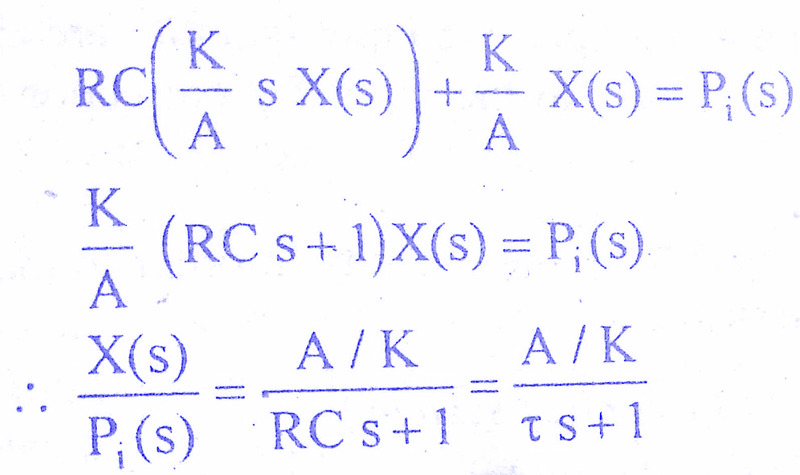 The force opposing the movement of the flat surface of bellow walls is proportional to displacement i.e, fo ∝ x(t). where K Constant representing stiffness of bellows. 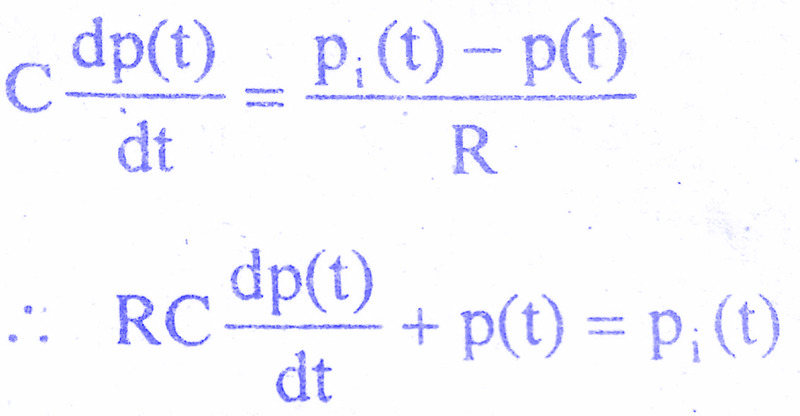 The above equation is the required transfer function of pneumatic system. In this post we have learnt Transfer Function of Pneumatic System.You can download this article as pdf,ppt.If you have queries you can mail us @ palakalaamarnath@gmail.com.Comment below if you have any queries!